Cloud Atlas... wow. It's a sprawling, vast film, covering a time span of some 450 years and several dozen characters. Tom Hanks, Halle Berry, Jim Broadbent, Hugh Grant, Keith David, Susan Sarandon, Jim Sturgess, David Gyasi, and Doona Bae all play multiple roles with interweaving stories across six time periods. The six time periods covered are a journey at sea story set in 1849, a musical prodigy story set in 1936, a conspiracy thriller set in 1973, a wacky British comedy of errors set during the present day, a totalitarian future set in 2144 and a post-apocalyptic survival film set "106 winters after the fall" (cited as 2321 in the film's credits). To go into anymore detail about plot specifics would be counter productive, and probably burn up this review's word count. Maybe there will be a fan cut of the film that puts all of the stories "in order," which may help with some of the literal plot aspects of the film, but that probably misses the point. What's more important than plot specifics in this film, are tone and characters. Presumably many of the featured characters are reincarnations of the same set of souls, living out their karma, and impacting the next generation by their actions. Action sequences are cross cut, lovers always have perfect timing, and characters frequently comment upon feelings of deja vu and longing. Characters also read about the lives of others who lived before them, a framing device that is slightly downplayed due to the frequent cuts back and forth between all six time periods. Hypothetically, acts of kindness and acts of selfishness reflect across the ages, but it may take the aforementioned linear cut (and a character flow chart - perhaps the souls jump actors too) to see how airtight the karmic retributions are. Reincarnation films have been made before, such as 2006's The Fountain or 1994's Being Human and ensemble films such as Syriana, Babel or the oeuvre of Robert Altman also come to mind. The best of these interlocking story films highlight human connectedness while showing how the lives of three dimensional characters are impacted. The worst of these films (Babel *cough* *cough*), set up a scenario that shows how "profound" human connections are, without doing anything dramatically with those connections (to paraphrase an anonymous commenter on my Babel review). Cloud Atlas lies somewhere in the middle of those extremes, and while the film does seem to find human connections profound, the various genre stories keep Could Atlas from navel gazing too much. Lamentably, Could Atlas has an almost cartoonish depiction of evil. Hugo Weaving typically appears as the baddie in any given time period, and it would have been nice to under stand why his characters are so evil. Sure he's effective in all the right menacing, moustache twirling ways, but his most interesting villains get the least amount of screen time and few of his characters are given motives. The acting is uniformly great, and it's actually a lot of fun to see everyone playing villains, heroes and everything in between. Unfortunately, there are surprisingly few memorable images to go along with the cosmic themes. Sure the production design is fantastic, maybe even beyond fantastic since the film convincingly portrays six time periods, but truly wonder-inspiring visuals are few and far between. The Wachowskis (siblings Lana and Andy) and Tom Tyker write and direct the film, with the Wachowskis directing the 1849, 2144 and 2321 sequences and Tyker taking the 1936, 1973 and 2012 stories. It's to the film's credit that any of the given time periods could have been made into separate films, films that might even have been hits. Cloud Atlas is based on a novel of the same name by David Mitchell. 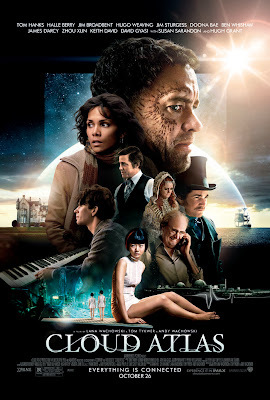 Cloud Atlas is fantastic, preposterous, intriguing, confusing, and most of all ambitious film. 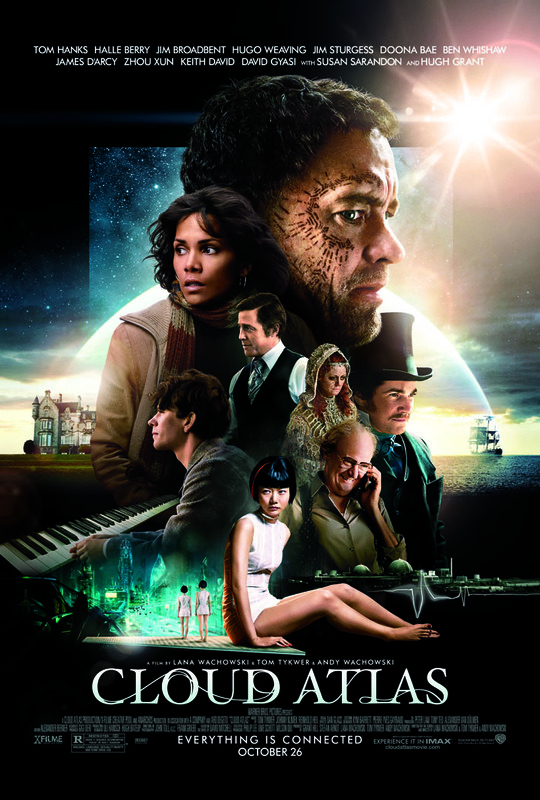 Cloud Atlas is impressive in its reach, but unfortunately falls a little shy of its mark.